As I mentioned in my write-up of Steven Spielberg’s Raiders of the Lost Ark, it was the film that inspired my love of movies, stirring my impressionable imagination like no motion picture had done before. 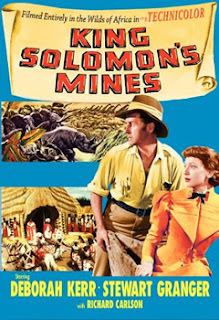 As I sat watching King Solomon’s Mines, I couldn’t help but wonder how many youngsters in 1950 shared a similar experience with this film. Like Raiders, King Solomon’s Mines is the kind of movie kids with a penchant for adventure will easily enjoy. Famous explorer Alan Quatermain (Stewart Granger) is hired by Elizabeth Curtis (Deborah Kerr) to track down her husband, an adventurer who, months earlier, undertook an expedition to locate the fabled King Solomon’s Mines and hasn’t been heard from since. Rumored to contain treasure beyond your wildest dreams, King Solomon’s Mines supposedly lies in the deepest jungles of Africa, which Quatermain and Elizabeth must now brave if they're to complete this rescue operation. Along the way, the small party encounters many obstacles, including angry tribesmen and a variety of vicious animals. As if these perils weren't bad enough, Quatermain also finds himself falling in love with Elizabeth, leaving him to wrestle with the fact that, if their mission is a success, he will lose her forever. King Solomon’s Mines was undoubtedly geared towards kids, offering enough adventure to keep their eyes glued to the screen for the duration. First off, the film features an assortment of wild animals. As the story opens, Quatermain is acting as guide to two big-game hunters, who've traveled to Africa for the express purpose of shooting an elephant (a scene that reveals, in no uncertain terms, how man is often the less noble beast). King Solomon’s Mines has it all, from crocodiles to monkeys, and everything in between. It is also beautifully shot, making ample use of the lush African landscape that serves as its backdrop. Filmed on location in Kenya, Tanzania and the Congo, King Solomon’s Mines works as a sort of travelogue, giving us the Dark Continent at its most majestic. Then, of course, the movie boasts plenty of adventure, with Quatermain and his party facing new dangers at every turn. With action, beauty and drama filling the screen from start to finish, King Solomon’s Mines is Tarzan, National Geographic, and The Travel Channel all rolled into one.